Now that the video haul is up, I can finally dig into my Chinatown goodies! (I know, I know, I already opened the Peepsicles. I was just too excited.) 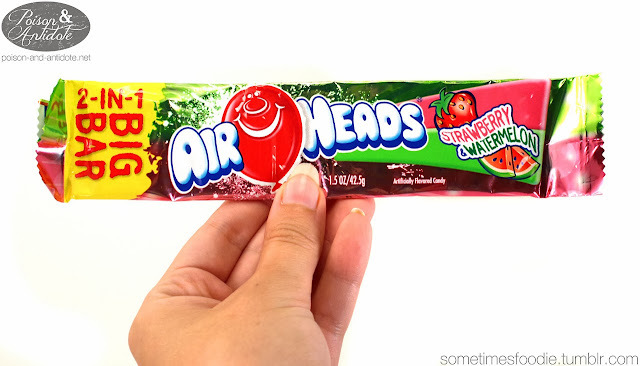 I have been eying this Airhead since I saw it in the store. There isn’t much to the packaging, it’s just a foiled plastic wrapper, but the design is fairly busy. I understand the two toned color scheme, and the logo is a must-have, but the bold yellow and red message saying, “2-in-1 Big Bar” is just over the top and obnoxious. Yellow is eye catching, but I feel like it would still stand out if the splattered background shape was white. I can’t be too critical. This is a candy that is made to appeal to children. Kids like bright colors and crazy designs, so I bet this works well with their target demographic. The candy inside is two-toned, just like the wrapper, and it looks like a strip of watermelon taffy. In reality, this is two Airhead flavors mushed into one bar. I don’t know about you guys, but this watermelon color looks really dark to me. (Queue the old timey music.) Back in my day Airheads used a lot less food dye and the candies were lighter, sorbet-like, colors. These seem really pigmented, I hope the candy still tastes the same. Yup, these taste just like I remembered. Realistic? No way. These flavors are entirely artificial, but I love them. 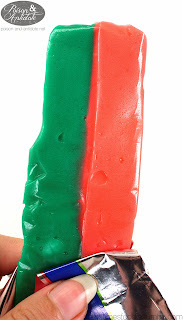 The watermelon has that Bubblicious-y artificial melon taste, which is sweet but slightly tangy. Strawberry is more artificial than the watermelon, but it is similar to the inside of a strawberry Skittle. When combined, the flavors create a tangy artificial fruity flavor similar to a fruit punch, but I prefer to eat the colors separately. 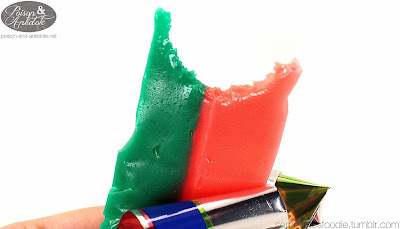 I grew up with Airheads, and these are my two favorite flavors, so I loved this bar. The only complaint I have is that towards the center there was this really hard lump of candy that caught me off guard. (I wasn’t expecting it and I hurt my teeth a little.) This might have been a stale section, or some sort of burnt lump of candy, or some kind of texture inconsistency, but it was only as tiny section of my candy. Even so, I already plan on buying more of these.